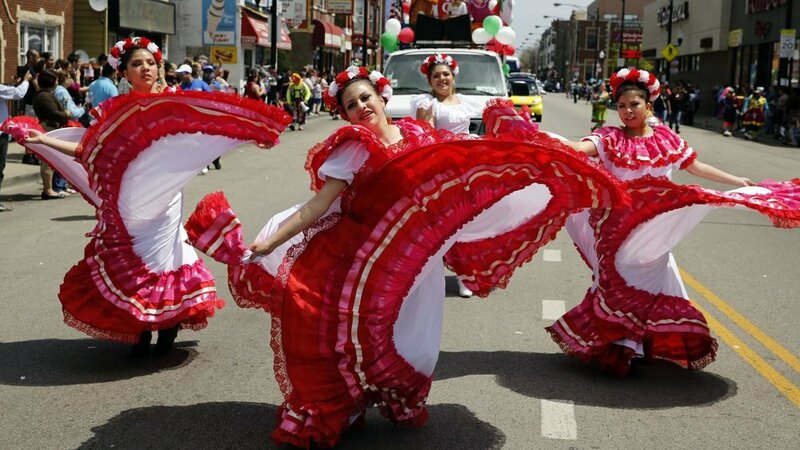 Is the sudden end to the 40 year run of Little Village’s Cinco de Mayo parade the nail in the gentrification coffin? PERSPECTIVE: Pilsen's Cinco de Mayo parade was yanked from the calendar just six days before its May 6 kick-off date, leaving business owners and would-be parade goers in Little Village and Pilsen with nothing but questions. If this month’s abrupt cancellation of the Cinco de Mayo parade in Chicago seems like a murky situation, information from the event’s organizer and area alderman only further illuminates its shadowy nature. The event was yanked from the calendar just six days before its May 6 kick-off date, leaving business owners and would-be parade goers in Little Village and Pilsen with nothing but questions. The parade route usually draws thousands of people to the area, which has one of the largest Mexican communities in the area. Businesses along the route prepare for a lucrative rush by scheduling or hiring extra staff and ordering extra food and drink products for customers. Not so much this year. Hector Escobar, who coordinates the parade via the Cermak Road Chamber of Commerce, announced its cancellation in a press release posted to Facebook on April 30, citing “sabotage and a conflict of interest” from 12th Ward Alderman George Cardenas as the cause. He claims that Cardenas influenced a number of the parade’s sponsors prior to the scheduled kick-off, which caused them to withdraw their support. Having had the chance to talk to both Escobar and Cardenas, their stories seem to conflict. The Alderman said that the permits and insurance for the event were not up to par and that a letter from a CPD commander was missing. However, Escobar refutes this, stating that he has been running the parade for decades and has a handle on how to file the paperwork. In spite of the controversy surrounding it, Alderman Cardenas maintained on that Wednesday that the parade could still go off on Sunday if the proper paperwork was submitted. However, it is difficult to know what the alderman’s true intentions are when he plays the part of concerned, supportive politician. Chief among Escobar’s accusations are that Cardenas wants his events to prosper over the traditional parade. He says the alderman’s family benefits financially through a handful of organizations he founded, including two new Chambers of Commerce and an institution named Excellence in Education. Over the past four years, these organizations have been involved in competing cultural events in the area as well as Riot Fest, Escobar claims, which he paints as dangerous for the community. Riot Fest has long since had opposition from the community, specifically since it got kicked out of Humboldt Park and Cardenas got involved in the push to bring it to Douglas Park in 2015. A local group called Concerned Citizens of Riot Fest formed that year, arguing that the black and brown residents in the surrounding communities of Little Village and North Lawndale didn’t have a say in the matter, yet would be the most affected by the negative results already seen at its previous locations. Tons of money is spent by the city (read: local tax dollars) on police, transit and the Department of Streets and Sanitation every year for the event. The park inevitably sees more than just temporary damage and locals struggle with access to area hospitals, public transit and cell service. This, in an area where schools are closing and black and brown folks are being arrested at disproportionate rates. What’s worse is the gentrification seen in Humboldt Park partially caused by Riot Fest, despite protests from its residents in the beginning. This displacement of locals and increasing racial tensions can conceivably be forecasted for Douglas Park as well. So what could be Cardenas’s motivation for offering up this space? “The community wants a mix. They want different things in the community. Just like coffees, you know, one is Starbucks, but there are also coffee houses that are independent. So it’s a mixed bag in the community, and that’s what you want,” Cardenas said. Business owners along the parade route expressed their disappointment and confusion over the parade’s cancellation. Carlos Garcia, owner of El Taco Azteca on Cermak Road, said that he had hired and scheduled extra staff for the event as well as ordered extra food and beverage supplies to accommodate the typically large crowds. Normally, the Cinco de Mayo parade would be the kick off to a busy summer season. This year, it ended up costing the business. “They wanna know what we have to do next in order to put pressure on the alderman..."
“They wanna know what we have to do next in order to put pressure on the alderman not to be against these cultural events,” Escobar commented. Despite a convoluted turn of events and political clashes, Escobar is already planning next year’s parade, even asking the alderman to lend a hand. “We’ve been receiving a lot of support from the community, from the businesses, and I’m sure we’re gonna be working hard to have a better event next year,” he said.